Wednesday saw reigning European Champions Real Madrid suffer a shock defeat to CSKA Moscow in the group stage of the UEFA Champions League. The defeat marks the Los Blancos side's biggest ever home defeat in Europe. It also makes CSKA Moscow the first team to win both group games against Real Madrid since Serie A giants Juventus in 2008-09. Goals from Fyodor Chalov, Georgi Shchennikov and Arnor Sigurdsson helped the under-dogs register a thumoing defeat over their opponents. Real's efforts in front of goal were all squandered and even Gareth Bale's introduction did nothing but to leave the side with an injured player. Real boss Santiago Solari has expressed regret over the unwanted record saying (via CNN), "I'm down because although we were through we wanted to finish the group with a win and we didn't do that." "We started the game well, especially the first 30-35 minutes, but we weren't good enough in either box and they punished us." 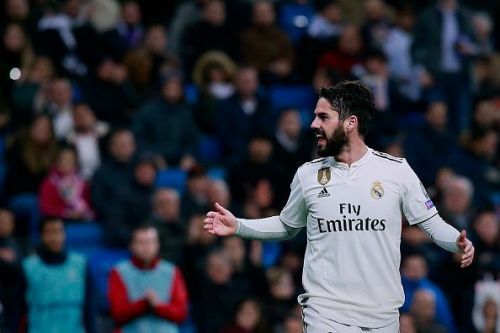 The Los Blancos players were not only booed at full time, but a section of the Bernabeu was heard to be hurling abuse at Isco after an incident on the pitch, following which they continued every time he touched the ball. According to Marca, Isco responded by angrily asking the fans, "What do you want?!" Isco's teammate Dani Carvajal has come out to defend Isco after the game saying (via Marca), "I have not seen if he was whistled by the fans or not, but the only thing I can say about Isco is that he has been here for many years and he is a brave player." "When things are not going well, he asks for the ball and tries to change the game rather than disappear." Real Madrid fans booing Isco, there own player. Madrid fans also Booed Ronaldo, one of the best to ever play football. Really hope Hazard doesn’t go to Madrid, he doesn’t deserve that shithole of a fanbase. AS: Isco telling the fans 'what do you want?' after missing a chance & the following whistles. Just because Isco was poor yesterday, it doesn't mean his overall rubbish. Clearly, there's problems within the Real Madrid camp where the morale is down. Isco is a quality player and they are missing Cristiano Ronaldo. Madrid fans booing is a joke, Hazard you want this? I am not even surprised Isco is being jeered by Madrid fans. They jeered Zidane. They jeered C. Ronaldo. They jeered Da Lima. Who is Isco? You know your form is bad when your name is Isco and are getting booed by the Bernabéu. That stuff is rarer than Griezmann not doing a Fortnite celebration after scoring.